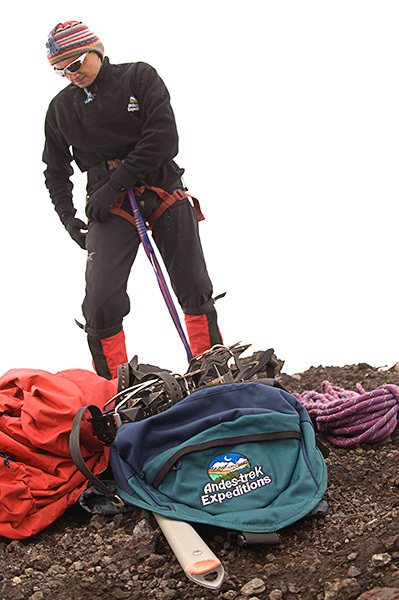 Understanding mountain hazards and being properly prepared in rescue techniques is the first step in becoming a responsible mountaineer. Every year, there are fatalities and injuries that occur in the mountains from cold and severe weather, avalanches, crevasse falls, exposed terrain, rock, and icefall. Dangers exist and accidents can happen on both highly technical routes and those that are labeled as “non-technical”. Being a prepared climber is the first step in having a fun and successful adventure in the mountains! In our five-day glacier mountaineering course, we deliver not only alpine skills, but also a clear and simple formula for making decisions in the mountains. Armed with the proper aptitude for mountain risk assessment, the technical savvy to protect yourself and your team as needed, and proficiency in dealing with a crevasse fall or other mountain rescue situations, the doors to a fantastic world of safe alpine climbing will be open wide. 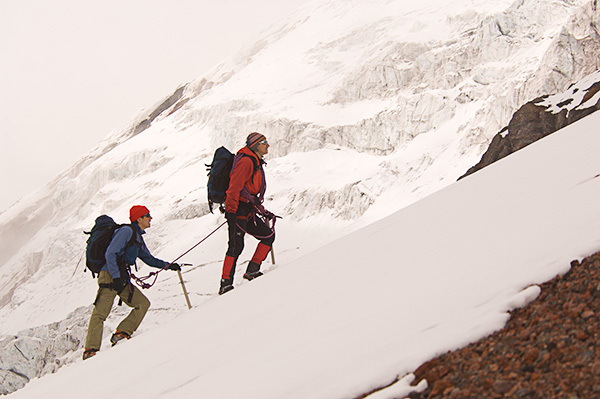 Andes Trek’s mountaineering courses prepare participants with little to no mountaineering experience to be contributing members of a climbing team. 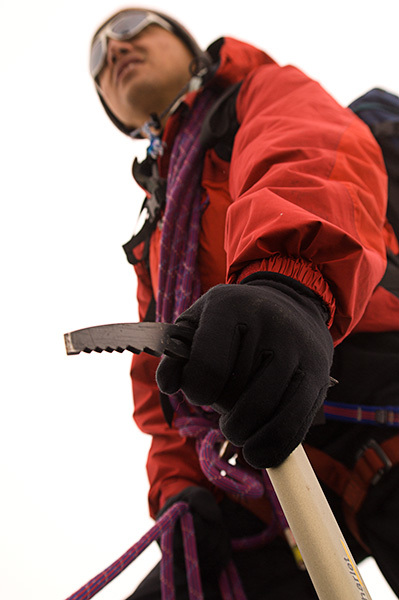 Courses aim to provide a thorough understanding of both objective & subjective alpine hazards, then systematically teach techniques to combat these dangers. A peak climb objective is included in the 5-day course where participants practice the skills and techniques discussed earlier. Students can take the lead (as appropriate) while the instructor supervises, offering guidance and support to optimize learning while ensuring the safety of the team. Drive from Quito to the Bergé, Ruales, Oleas Refuge (4,650 m/15,257 ft) in the Cayambe-Coca National Park. (2 hours from Quito). 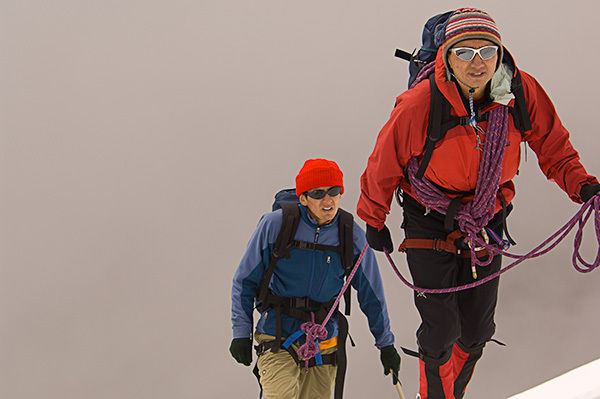 Then we will start with an introduction to mountaineering & hazard management, equipment use and care, climbing knots, and altitude physiology. Wake up about 8:00 am, and prepare for a full day on the glacier. We will hike 30 minutes up to the ice where we will begin practicing glacier travel with our crampons and ice axe, kicking steps and following tracks, basic rescue skills (self-belay, self-arrest, team arrest), rope team travel techniques, and snow/ice anchors. Around 4:30 pm, we descend back to the refuge for a hot drink and dinner. We will spend the morning in the refuge learning belay systems, equalized anchors, and haul systems – to prepare us for crevasse rescue. After a thorough lesson on dry land, we return to the glacier (around 1:00 pm) to put our new skills to the test on the snow – at the edge of a real crevasse. The entire afternoon is dedicated to the practice of this important skill, crevasse rescue, as crevasses are a common hazard of all glaciated climbs. Return to the refuge around 5:30, have dinner and sleep. Leave the refuge at 7:30 a.m. and head up to the glacier to review the techniques we have been learning and scenarios of glacier travel. Participants practice leading their roped teams using the skills learned in the previous 2 days. Teams will practice route finding, reading and planning for hazards, and group management. We will travel through crevasse fields and up/down steep slopes where both running and fixed belays will be used. We will also perform a mock-crevasse rescue. In the afternoon, we will practice climbing on an ice wall. 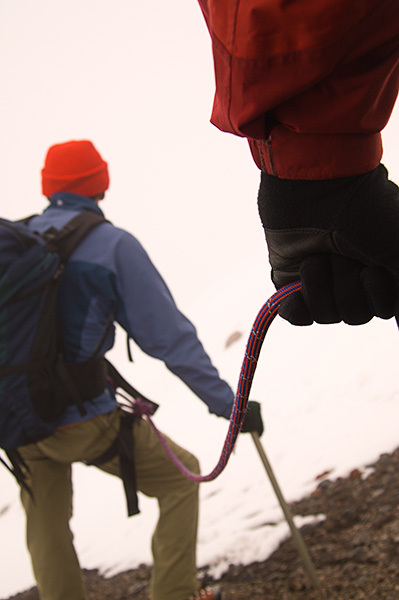 We start off by setting up a top-rope anchor system, then spend a few hours ice climbing. We will cover basic climbing technique, and lead climbing if there is interest. In the late afternoon, we will have a pre-summit planning discussion for the following days climbing objectives. Participants will determine what needs to be done in preparation for the climb (route recon, equipment prep, rope team divisions, food & water prep) and divide up the responsibilities amongst themselves. Dinner will be served around 5 pm and everyone will get to sleep early in anticipation of the next days climb. Rise and shine early! Around 1:00 am we will have breakfast and gear up for our climb. We head up to the glacier and begin our summit attempt. Depending on the snow conditions, weather, and team health/fitness, the summit can be reached in 6-8 hours. The descent will take 3-4 hours and you should be back in the refuge by mid-afternoon for a warm lunch and some rest. Then we will pack up, and begin the return to Quito. Participants will be returned to their hotels for a well-deserved shower and a night on the town!